Micro LED Door Handle Kit will highlight underneath your door handles. Create LED lighting under your door handles with the Single Color Micro LED Door Handle kit! 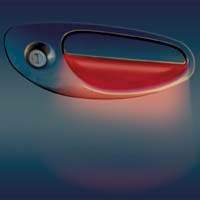 Bring glow where it's never been before with PlasmaGlow's Micro LED Door Handle Kit! This set of specially designed micro-LED panels install under your door handle, providing an ultra-bright glow in an eye catching place. Also good for finding the "Key-Hole" late at night! If you are a professional looking for the highest quality LED Door handle kits, look no further than the Micro LED Door handle kit. Micro LED Door Handle Kit- Back to Home Page.